Open Wi-Fi networks are everywhere, if you’re stationed in an area with tons of them you’ll probably want to prioritize your own network to be the top wireless network to join so you don’t accidentally end up on someone elses unsecured network. Prioritizing is also a good idea if you use Personal Hotspot in public so you don’t end up on an open public access point. The simplest way to prevent a Mac from joining one network over another is to set priority, giving your preferred wifi routers precedent over the others. Whatever the topmost wi-fi network is will be the first to be joined, assuming it’s available. If the topmost network isn’t available the next one down will become the preferred network, and so on. With the iPhone Hotspot example you’d probably want that to be at the very top of the list. For an additional layer of security and to prevent a Mac from inadvertently joining the wrong network, you can check the “Ask to join new networks” box within Network preferences. This will cause OS X to behave more like iOS and ask you before it joins whatever wi-fi network is open and available, though the wifi pop-ups can get annoying. I wish you could do the same on iPad and iPhone, I had to turn off the wifi popups because it won’t prioritize my home networks (base and extender) and I live in a busy apartment. Thanks for the tip, hope they do such things for iOS soon. I have XFinity logged in and right outside my house, I get xfinity, so, before coming into the house, I get connected to the XFinity, but never automatically goes to my home network. I have some devices which needs to be in the same network to operate remotely, like Samsung TV, Chromecast, Google Home, etc., and it is a pain to reconnect to my home network everytime I come home from outside. 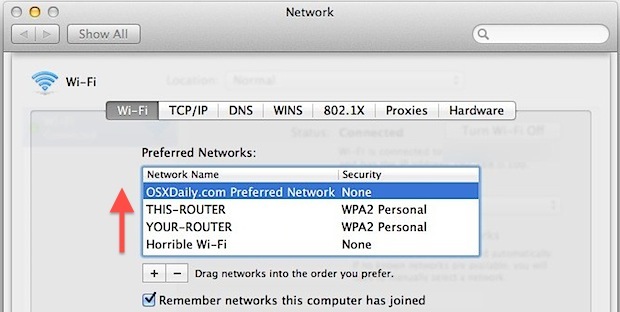 Would be great is OS X could prioritise the strongest WiFi network over weak networks. I often work in different buildings close to each other with separate WiFi networks and it is hugely annoying that when I am in the wrong building the Mac links to the other building’s network even though the signal is very weak. It was driving me crazy that my LappleTop kept connecting to xfinitywifi instead of my own home wifi network. This fixed it!